There will be only one winner in each of the track events at the Summer Olympics this year. It’s the nature of competition. 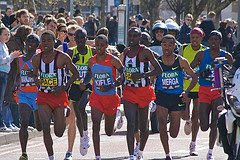 Every individual athlete, however, will have prepared thousands of hours with the goal of finishing the race with a personal record. They will think only of the race that is before them; not finishing isn’t an option. Each of us has a race to run. What we need to ask ourselves is this: have we put the hours into training our spiritual life such that we will be able to endure to the end. In the same way as the Olympic athlete the race we are called to run is individual. While we may find ourselves in a “pack” there will also be those times when we’re behind or ahead. There is a significant difference here, however, in that our spiritual race is not a competition between other Jesus followers. God calls us to run the race that He has set before us. The challenge is staying focused. Here is where the analogy of the athlete again connects. An Olympic runner, while aware of the presence and location of the other athletes, remains focused on his own race. Well trained, this athlete resists the temptation to run the race like someone else even if they are ahead. Endurance is built over time. You can’t run an enduring race without building up some stamina. How are you training yourself to build your endurance to run the race set before you? the race you have set before me.